I retired the ironing board to a hook by the basement stairs. With luck, it will grow dusty as it approaches genuine antique status. The kitchen cart is maple, a wood so solid it requires metal-working bits for fabrication. I don’t hesitate to iron the occasional table cloth directly on the cart, padding the top with a fresh bath towel. Over the week-end I got to the Christmas tablecloth, which happened to have just the right colors for Mardi Gras. 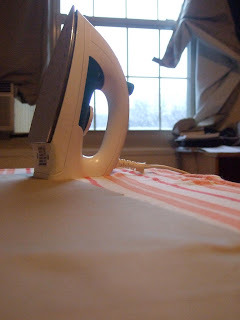 On an ironing table, I can finish a cloth in a three-minute song or during a commercial break. The cloth then rests on a warm radiator for a while to finish drying. This post is dedicated to Mary W., who in 1975 explained that her ironing basket was labelled “Goodwill”.